1.5km bike or 900m scoot. The Donut Duathlon takes advantage of the Torbay Velopark to offer a fast, flat and completely traffic free duathlon course. Ideal for all ages & for beginners and seasoned athletes alike, the Donut will help kick start your season with a flat parkland run, a fast ride on the smooth tarmac of the Velopark followed by a shorter run to finish. The Donut Duathlon is very family friendly. We also offer shorter distances for children aged 3 and above. Parents are welcome to run/bike alongside children under 8 in our mini duathlon. They can also help their kids with their bikes/scooters in transition. And there’s also a Go Tri /Novice event for those new to the sport or who prefer a shorter race. Medals and donuts for all finishers whichever race they’re doing! For this event any roadworthy bike will do: MTBs, hybrids or road bikes are all fine. In the Sprint race only drafting is permitted. But because some people don’t own a road bike we are allowing TT/triathlon bikes. 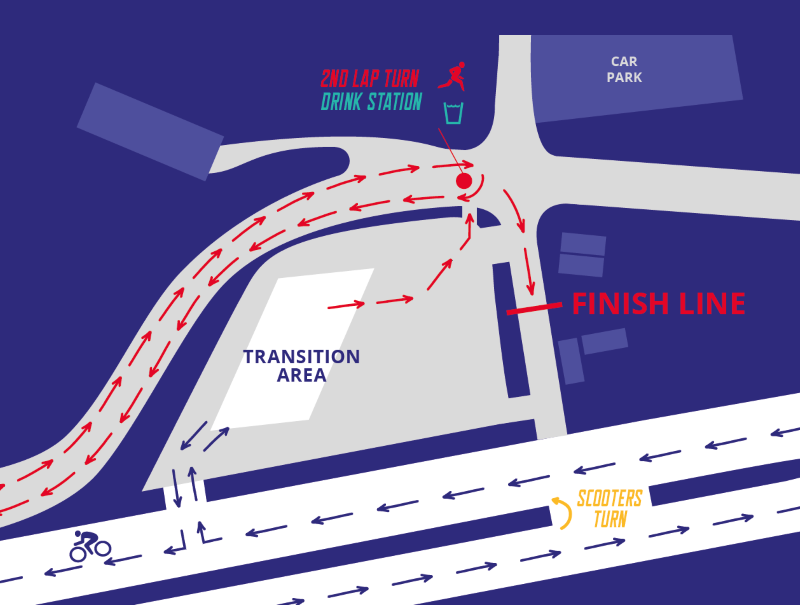 Click this map of the Donut transition area for detailed maps of transition and the bike & run courses.